I traveled to a meeting yesterday where we had to do a community-building activity in small groups. We were asked to select a vehicle that best illustrates our understanding of our own personality characteristics, draw a picture of it, and write 5 attributes of the vehicle. Then we had to share with the group. So, I picked a taxi. I explained that taxis represent our transient, impermanent lives and relationships. Taxis are a vehicle for helping people get from point A to point B, helping people get where they need to go. While people are in the taxi, there are lots of stories to share, finding out where people are coming from and where they are going, then everyone ultimately moves on once the taxi gets them where they need for now. 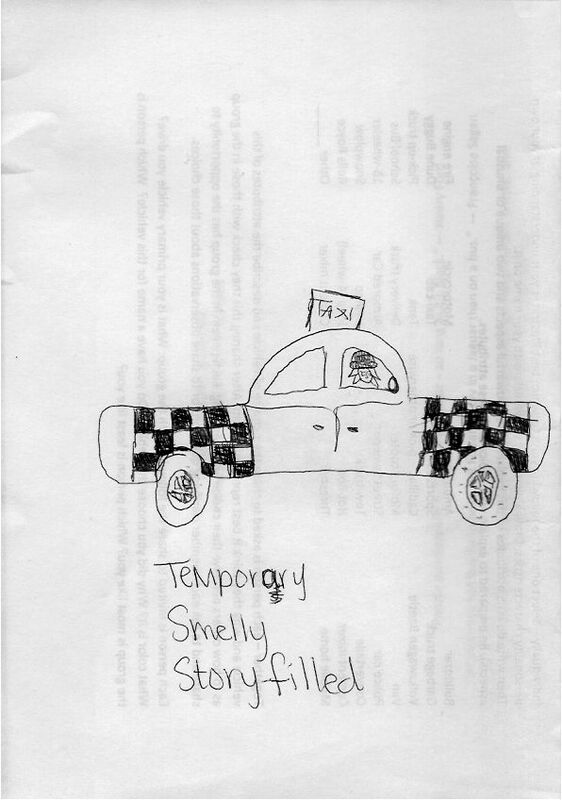 Oh, and taxis are smelly. Like me. As finish telling my group about my taxi, a 70-something man next to me shares his car. He's also a taxi, for pretty much the exact same reasons I am. PS. I obviously didn't come up with 5 attributes. PPS. I'm still trucking (ha) along with my works for KC Fringe Festival, trying not to forget the regular blog ideas I'm getting along the way.